This week it was revealed that the Conservatives had sealed a deal with an important section of the media, when the Sun announced that it was abandoning it's support for Labour. Peter Mandelson put it well on Newsnight this week when he described the move as 'An Exocet being launched into the middle of the Labour conference'. To some people it was just confirmation of something they knew already - that the Sun's support for Labour was little other than a distant memory. So they, along with those who wanted to minimise it's impact, treated it as being of little significance. I disagree - it's very significant. There's no way that Murdoch would have taken such a partisan step unless he was absolutely sure that Conservative plans for control and regulation of the media were broadly in-step with his own agenda. And to my mind, the crucial centre-point of that agenda is breaking the BBC's monopoly of free-news delivery. This is something that is key to all the big media players, so they too will want to support the Conservatives. And now James Murdoch has taken his position they will feel emboldened to do so. It will be interesting to see how the BBC react. Will they see it like this and chose to go to war? and if they did could they win? Possibly. The monopoly of state television is so pervasive that it would be possible to support the government by slowly, over-time, starting to interpret every move the government makes positively, and every move the Conservative opposition makes, negatively. It would be possible in a 9 month time-scale if they had a product to sell. But this government is shattered. The fact that the Sun announcement crushed their fragile conference confidence and sent them reeling this week illustrated it beyond doubt. Would the BBC really want to try and convince the electorate that the Labour party is fit to govern again to protect it's monopoly? I think it would pointless to try. Whilst the deal may not be sealed with the electorate yet, the deal for a Conservative Govt is now sealed with enough of the media to mean that to fight it, the BBC would have to so obviously become an 'organ of the state', banging out Labour propaganda on a daily basis, to such an extent that if it lost, the incoming government would have to dismantle it completely to respond to public demands for an independant press and free-speech. 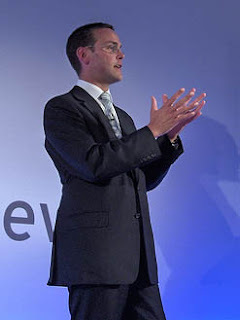 Thanks to Esthr for the picture of James Murdoch cradling the BBC's invisible testicles in his hands.